100 Hour Candles for Pennies! I'm always on the look out for back ups to my back ups. When I found this video, I HAD to try it for myself. 1) I took a glass votive, filled w/ generic plain vegetable shortening and inserted an old birthday candle in the middle. 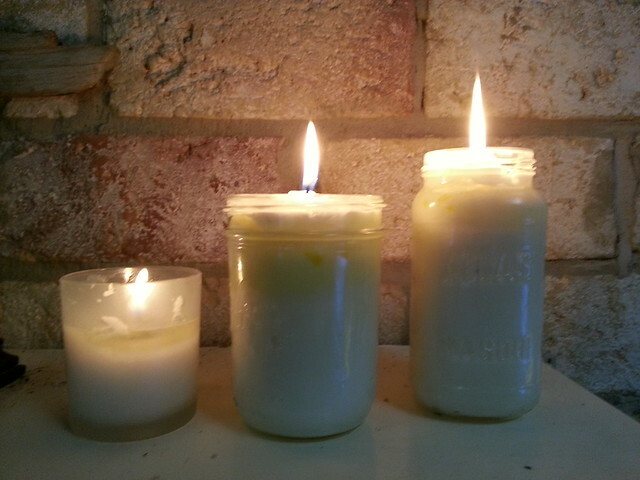 2) I took an old pickle jar, also filled it w/ shortening and inserted a short tapered candle in the middle. Side note ~ I placed one of my traditional votive candles next to the shortening votive candle and the light appears to be brighter! Hope my fellow Texas Preppers find this useful. Pretty impressive! My votive w/ birthday candle burned for 16 (non-continuous) hours before the birthday candle floated and extinguished. The pickle jar candle, with an old taper candle centered in the shortening, has also burned approximately 16 (non-continuous) hours and only consumed about 1/4 of an inch of candle and vegetable shortening. We are continuing to burn both candles today. DH is measuring the "official" usage of the shortening. p.s. I have watched videos of people inserting everything from twisted newspaper, typing paper, to cotton string. While very economical, I'm using the birthday and taper candles because I have them stockpiled and it seems a more efficient use of them. ^^^ Mystry....you beat me to my next thread! I'm Sorry. Both will be great though. No worries. Glad you're posting! I'm have the best success with the shortening by placing it in tall narrow jars and inserting taper candles cut to fit the height of the jar. c) an old Classico Alfredo sauce jar. The small Glade votive has approx. 20 hours of burn time and has only consumed about 3/4 of the candle and shortening. Pretty impressive! I'm skipping on the b-day candles. They worked well but with prolonged burning they became soft, would fall into the liquid shortening and extinguish themselves. ^^^ The winner is...the candle on the far right! I've burned the Classico Alfredo jar, several nights a week, for most of the winter. (On some cold days I burned it all day, easily 12 + hours.) It only recently needed to be refilled. It's relatively clean burning with only some mild soot build up near the end of the candle's life. That soot was easily wiped off the lip with a damp paper towel. I didn't keep track of the hours, but an estimation of 100 hours of burn time would be very plausible!